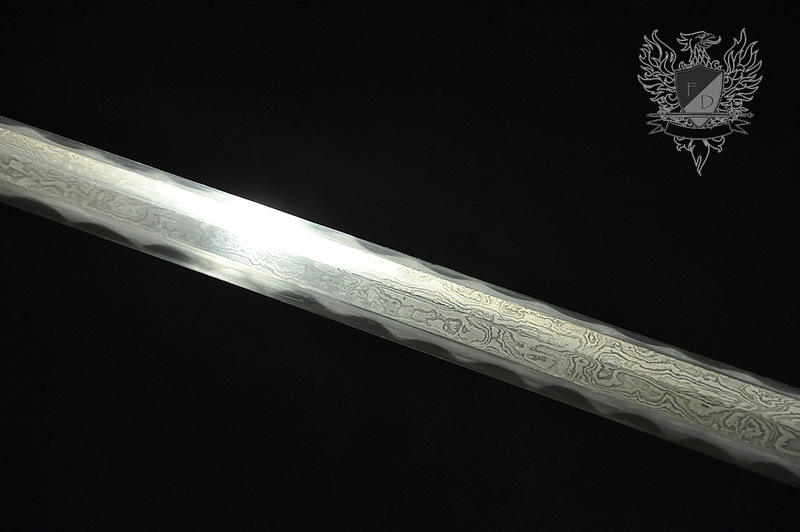 Made to Order, Ships in 4-6 weeks. 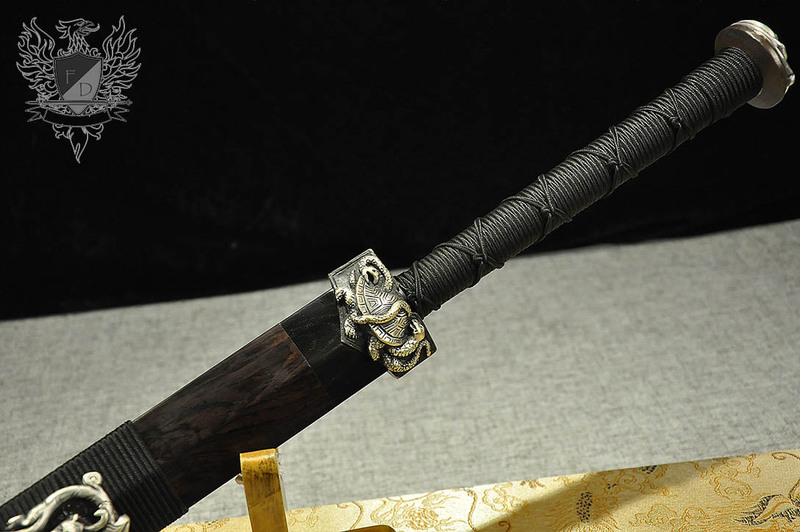 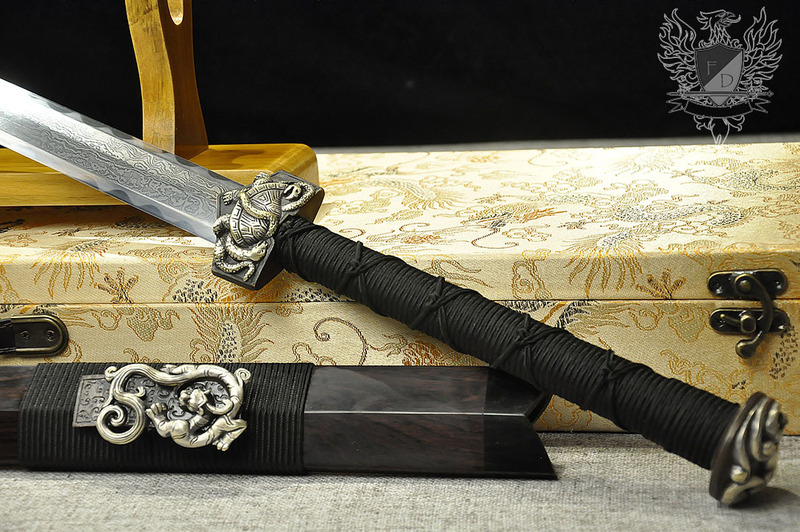 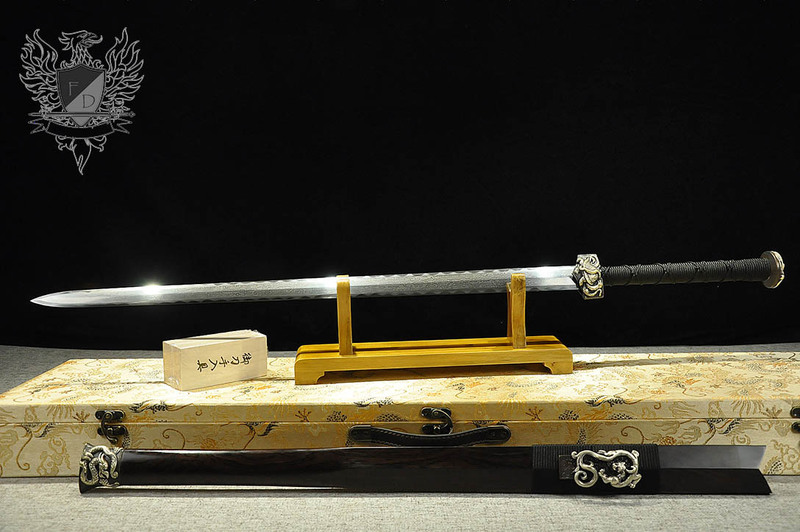 Known as the "Gentleman of Weapons" this stunning, mastersmith forged Jian is designed for extremely precise thrusting but is more than capable of delivering limb severing, shearing cuts. 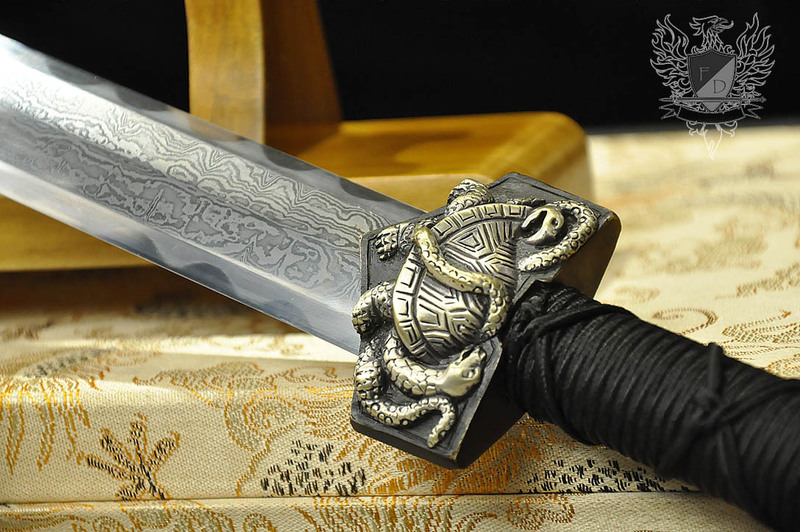 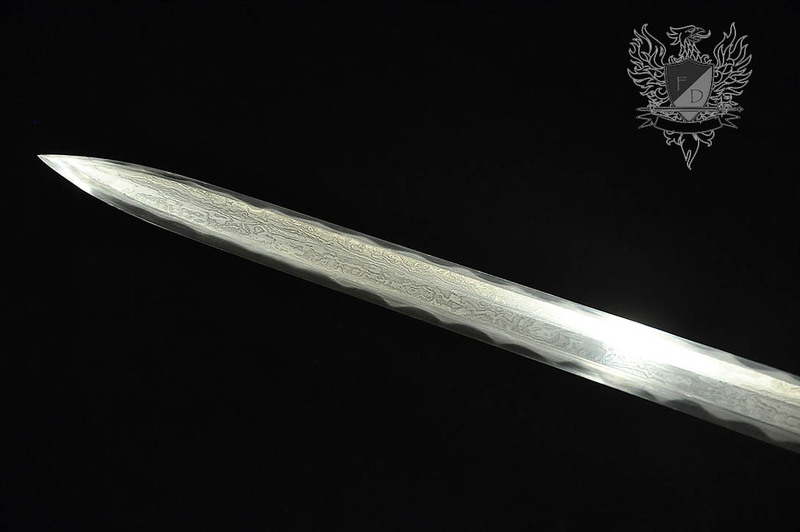 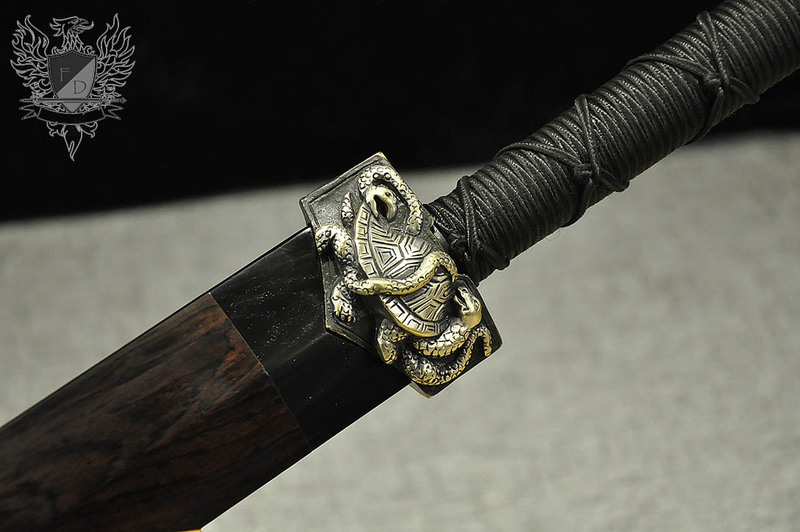 This particular piece has an amazingly detailed, folded 1095 damascus steel blade that has also been differentially hardened on both edges to produce an extra dimension of visual appeal, but more importantly, serves a functional purpose of hardening the edge so that it can take and keep an extremely keen cutting surface. 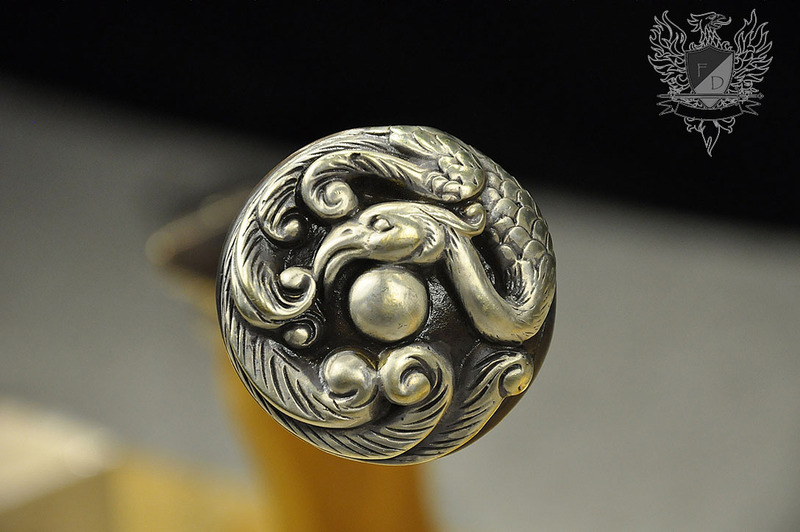 The fittings are solid brass and highly symbolic, featuring the "4 beasts": The Azure Dragon of the East, the Vermillion Bird of the South, the White Tiger of the West and the Black Turtle of the North. 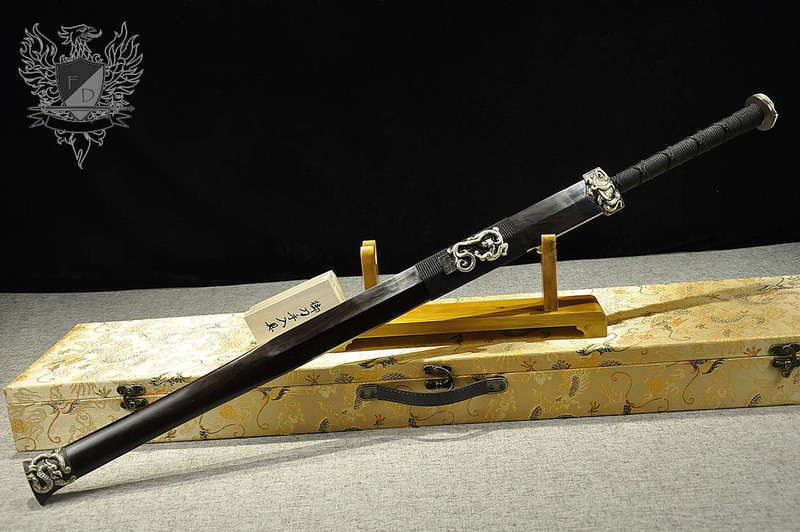 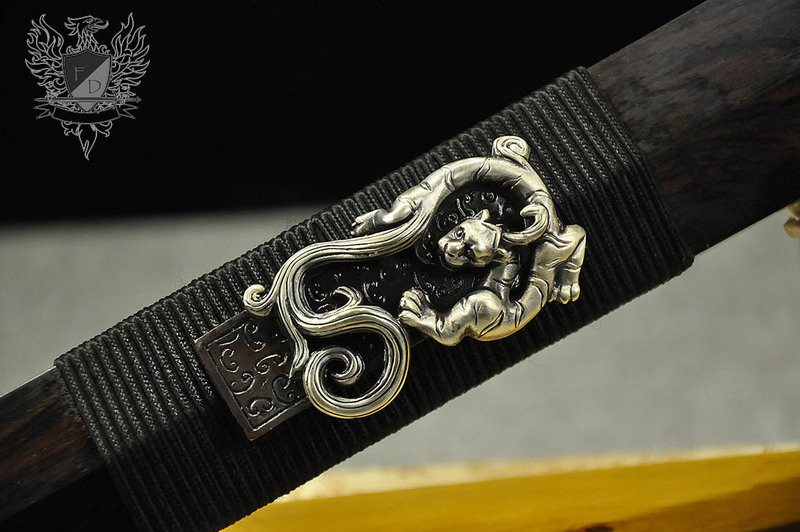 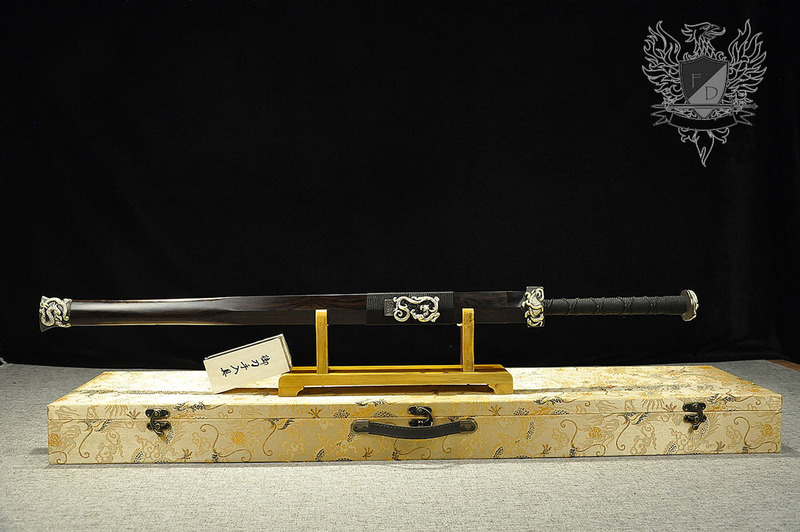 These 4 beasts, also correspond with the 4 seasons and the 5 elements and the symbolism is repeated throughout all of East Asia including China, Korea and Japan - as well as neighboring Vietnam - but it all adds up on one thing: a highly traditional design that truly compliments this extraordinary Chinese blade. 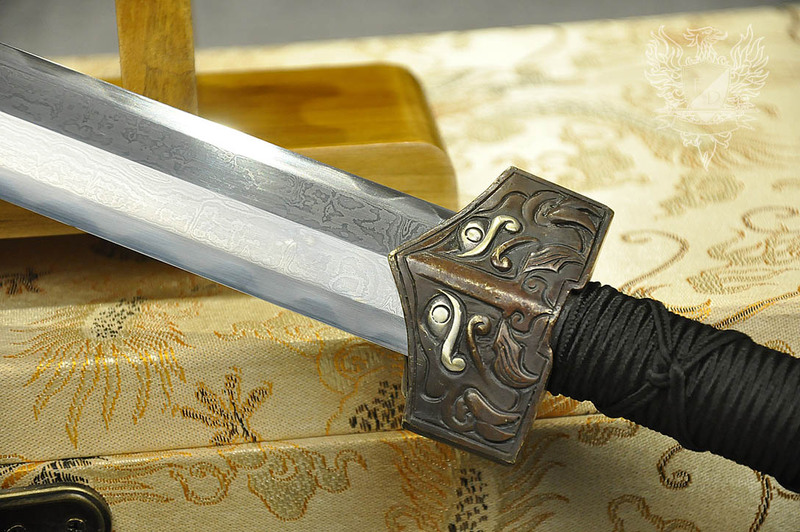 Fast in the hand without being the least bit "whippy" - this sword is a modern day classic. 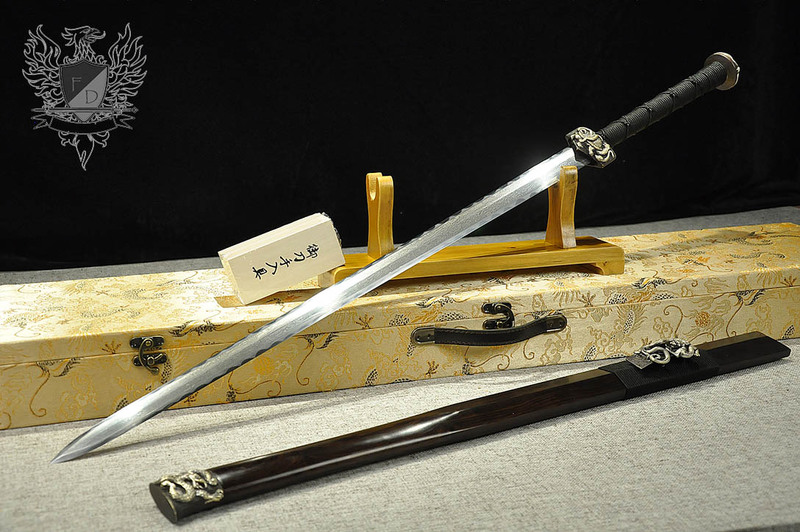 Master Smith Hand Forged, FOLDED and Sharpened 1095 carbon steel blade with differentially hardened blade. 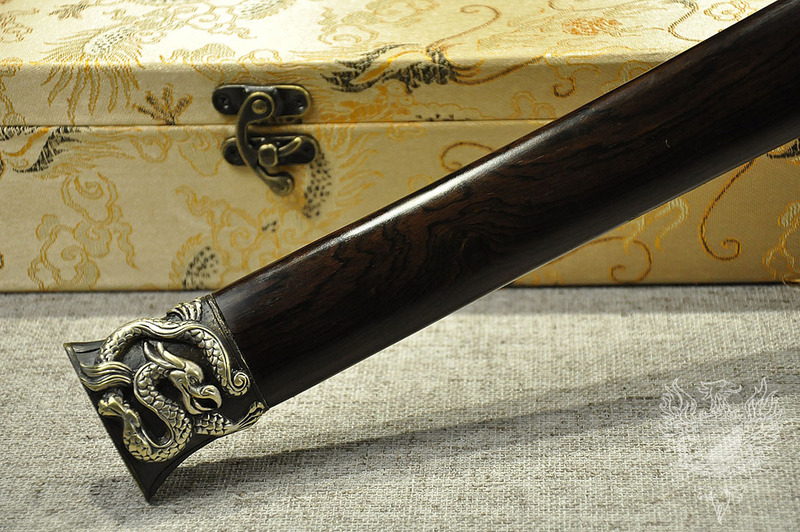 Solid Brass and Ebony Hardwood fittings.